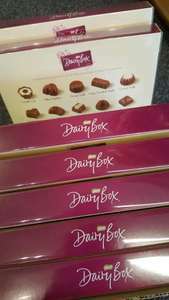 Dairy Box The Deluxe Collection only £3.50 @ Premier Stores nationwide! Saving around half usual price! £6.00 @ Tesco atm! Also at Londis, which is at my local Shell garage. That would make sense as both Premier Stores & Londis are owned by Booker Group! So they'll be likely to do same/similar offers.